Building an elevated milking stanchion may be one of the best remedies for dealing with the pain that can occur when have to milk cows that are low to the ground. While the udders are often hard to reach, it’s the position you have to be in when milking that can make the task uncomfortable. 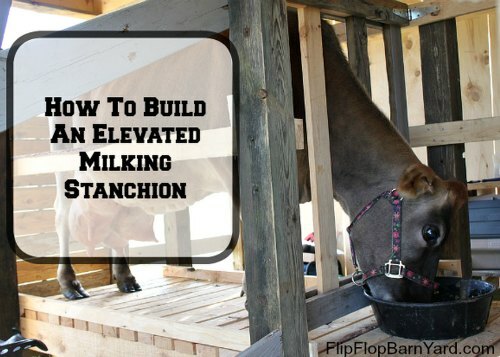 Fortunately, building an elevated milking stanchion is an easy project that will make a substantial difference on your homestead. The most important aspect about this project is the materials and tools that are needed. You will need to use treated lumber as this will not rot when the frame in placed on the ground. Treated lumber comes in boards that are found at any home improvement store and can be easily cut to make an elevated milking stanchion. Assembling your elevated milking stanchion will also require the use of screws or nails. This will mean you will need to use a hammer or a power drill. You may find that a power drill is a better option. You can make a platform for any elevated milking stanchion by using 2 x 4 boards. However, you should not apply paint to the boards for the platform. Ramps will need to be made for your milking stanchion. This will be similar to building steps, but you do not need to cut stringers for the treads. However, you will need to make sure the fame and the ramp is sturdy and capable of holding the weight of any cow you want to milk. You will need to have a ramp that goes up to the platform and a ramp coming down. The best place to build an elevated milking stanchion is in any covered area. This can include a barn or any open structure that has a covered roof. You will also need to determine the best place to locate the milking station when you choose the ideal covered area. Fortunately, a simple stool is all that you will need once the milking station is complete.